A light rain comes and goes. Dripping off my poncho and drying away in moments of calm as I walk. 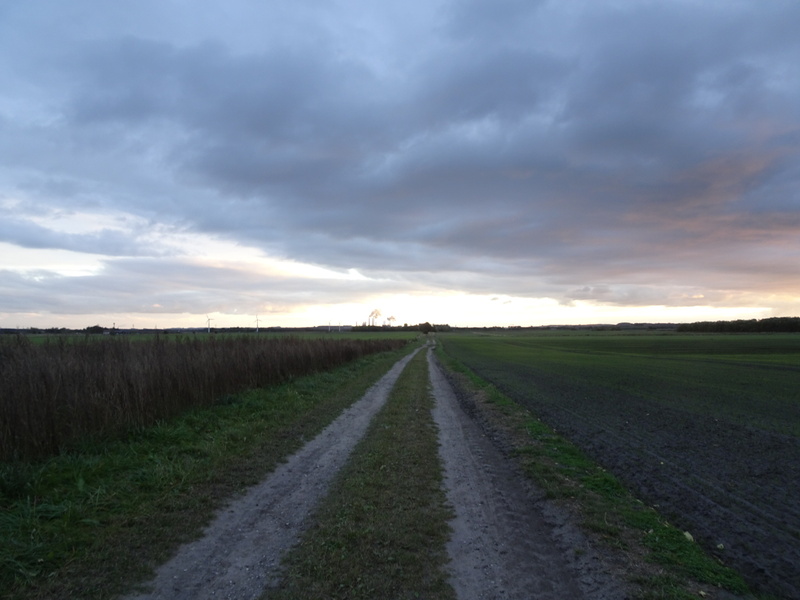 I pass quietly along the Hærvejen, the old ox trail, the army road that stretches down the middle of Denmark. It’s taken people to and from Germany for over a thousand years, before either country even existed, and it will take me too if I keep following it. It’s not one path, but a network of roads and trails linked together near the height of land where the rivers are just streams and the ground is solid. I pass plowed fields and fresh cut grain, herds of cows and grazing horses, lone farmhouses and small villages. If a place is big enough, it gets a name on a map and a square-towered church to rise from its center. The miles melt away in the rain and I reach Viborg in the late afternoon. It’s a big city, the kind that builds slowly from the edges in as you walk and watch it come to life around you. The Hærvejen is old history there, shoved on sidewalks and side streets, replaced by highways and trains that roar across the countryside. In the heart of the city, I cross the tracks on a bridge between station platforms and head to the edge of town. Aalborg is two hours away by rail, but it took me two days, just as a travel guide from the 1100s promised travelers almost a thousand years ago. Posted in Europe North to SouthTagged Aalborg, backpacking, ENS, Europe North to South, featured, Hærvejen, hiking, thru-hiking, ViborgBookmark the permalink.